How do I fit the Tangram pieces in the storage container? These two pictures show how to fit your Tangram pieces in the storage container. Where can I order Osmo Tangram? Tangram is available for purchase worldwide on our website as part of our kits: https://playosmo.com/en/shopping/. Tangram is not available for sale separately at this time. What ages is Osmo Tangram designed for? Intro to Tangram is appropriate for kids age 3+, and Tangram is appropriate for kids 5-11. Most adults find many of the hard levels very challenging. Osmo Tangram is really for kids of all ages! What is included in the Osmo Tangram box? Osmo Tangram comes with seven (7) colored wood tangram pieces. What is the educational value of Osmo Tangram? Tangram teaches spatial relational skills while fostering social-emotional skills and creative thinking. Do you have instructions for Osmo Tangram? 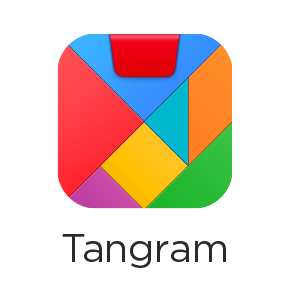 Did you know that there is an in-app manual to help you get acquainted with Tangram? It can be accessed via the Settings menu, under Manual. There's additional information about the app in the App Store. Are there different levels in Osmo Tangram? Yes, in the Tangram game there are four levels: Easy, Medium, Hard, and Challenge. Each level corresponds to a color in the game: easy = yellow, medium = orange, hard = red, and challenge = blue. Junior mode is made up of about a dozen puzzles, some of which use only a couple of puzzle pieces. The game gives the player many visual and audio cues to assist in completing the puzzles. Junior mode puzzles do not use all of the pieces. Treasure mode features a large map that the player can use to navigate his/her way throughout. Treasure mode includes levels Easy, Medium, Hard, Harder. Every puzzle in Treasure mode uses all of the pieces. When Classic mode is enabled, the puzzles appear as a giant grid of puzzles, with none of the treasures or trees or anything like that on it. What's the difference between Intro to Osmo Tangram and Osmo Tangram? Intro to Tangram is intended for younger kids. It also provides an introduction to the full version of the game. There are hundreds of puzzles for you to unlock as you play the game and improve! If the game says “Center your pieces,” it means that your puzzle is close to the edge of Osmo's field of vision. To fix this, slide your puzzle until it's centered in front of the iPad. Can I use my own tangram pieces with Osmo Tangram? The Tangram pieces included are made specifically for Osmo, so they will work better than other pieces. You�can try using your own pieces if you'd like, but it is very rare that non-Osmo tangram pieces work with Osmo (due to our special visioning technology). Can I make my own Osmo Tangram puzzles? While we celebrate your ambition, no, the game does not provide this option. However, there are over 400 puzzles for you to unlock as you play the game! What do I do if Osmo Tangram crashes? Any time an app crashes, it's good practice to close other open apps (double tap home button and swipe the windows up to close them). Also please try reinstalling the Tangram app and restarting the iPad. If it doesn't help, please write us at support@playosmo.com with your iPad model number. You can find the model number printed on the back of your iPad.